To Rule The Night HAND SIGNED by Jim Irwin! James! Moonwalker! Apollo 15! Rare! Sales tax may apply when shipping to: CO*(2.6%), CT*(6.35%), GA*(4.0%), HI*(4.0%), IL*(6.25%), IN*(7.0%), IA*, KY*(6.0%), LA*(4.45%), ME*(5.5%), MD*(6.0%), MA*(6.25%), MI*(6.0%), MN*, NE*(5.5%), NV*(6.85%), NJ*(6.625%), NC*(4.75%), ND*(5.0%), OK*(4.5%), PA*(6.0%), RI*(7.0%), SC*(6.0%), SD*(4.5%), UT*(4.7%), VT*(6.0%), WA*, WV*(6.0%), WI*(5.0%), WY*(4.0%). Magnificent memoir by this pioneer, hero and man of God. 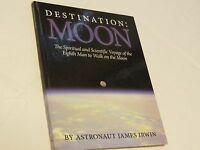 Gteat value and content, plus wonderful hand inscription by the author (legendary Moonwalker James Irwin, now deceased). Bought this copy for the signature, but book content is great also. Good value, good price & service. Recommended.